Fitting an awl blade into the handle completely straight is quite a challenge! 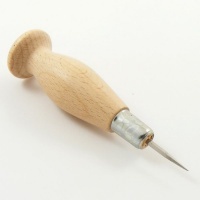 We have a few awls with 'wonky' blades, which we are selling at less than half the usual price. They are brand new and very sharp, but the blades are off centre. 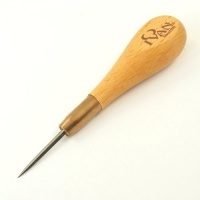 This listing is for a large sized sewing awl, which has a blade of approx 35mm long, and at it's base, about 3.5mm wide. 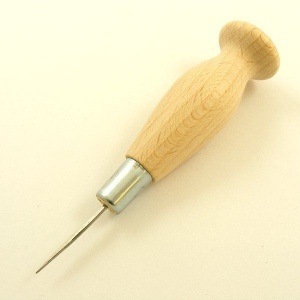 It's ideally suited to heavy stitching projects such as belts and dog leads. 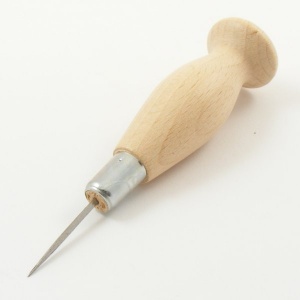 Before buying an awl: There are other ways to make stitch holes in your leather, some of them quicker and easier than using an awl! 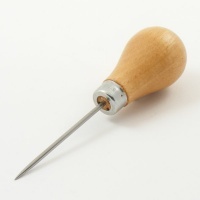 You might like to consider a stitch punch instead, especially if you have heavy leather to stitch, so please take a look at our stitching tools section before you make your purchase.